Includes 2 cups for putting back and forth. Adjustable Putting Cup Convertible Great Practice Equipment converts from standard size to challen.. Both allow putts from any direction. Plastic Putting Cup. 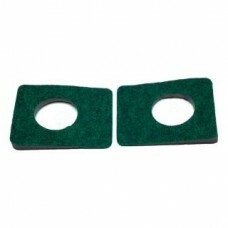 Dimensions: 27 x 18.5 x 26 Green..
A great practice aid for your putting stroke. 9 x 3-Feet kidney shaped green gives you 3 cups to a..